Can you stand another year-end list? Below are what we believe were the ten biggest news stories of 2011 for animal rights initiatives. While some of these generated massive amounts of ink and airtime, a few were important stories that flew under the radar. A few have importance to the animal rights community, while others are more notable for their impact on the animal-eating/using/wearing public. 1. Mercy For Animals’ undercover investigation into E6 Cattle Co. in Hart, Texas, received so much press and public attention it actually impacted the market price of cattle futures. One of the nation’s best investigators gained employment at E6, where he observed and recorded workers bashing in the skulls of calves with hammers and pickaxes, among other horrors. 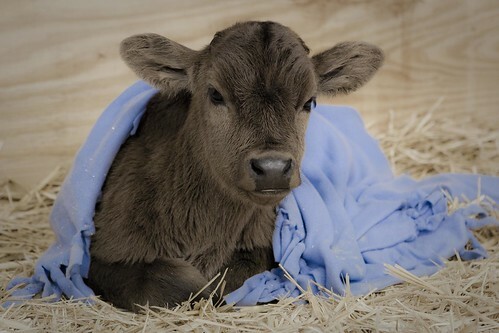 (The facility specializes in raising female calves until they are old enough to be impregnated and turned into milk machines.) The American Veterinary Medical Association, not known for opposing agribusiness, even issued a statement condemning E6’s behavior. For a short time, the undercover video was banned by YouTube – a bad PR move on their part – and news of the ban reached the sizable audience of consumer tech websites, so the video received even more views. For many Americans, watching this footage was the first time they had ever considered the cruelty inherent in dairy products. 2. West Hollywood became the first fur-free city in the U.S. and one of only a handful in the world. This small independent city, surrounded on all sides by Los Angeles like Vatican City is by Rome, voted in September to ban the sale of fur apparel after a time interval to allow retailers to phase out inventory. “Fur Free WeHo” received national media attention. Although largely a symbolic gesture in terms of its impact on fur-bearing animals, the legislation drafted will serve as a model for other communities. Similar campaigns in other cities are already underway. 3. Congress introduced the Traveling Exotic Animal Protection Act (TEAPA), now HR 3359, which would effectively shut down traveling circuses such as Ringling Bros. in the U.S. Animal Defenders International led the charge after successful circus bans in other countries, with assistance from experts from the Performing Animal Welfare Society, exotic animal veterinarian Dr. Mel Richardson, philanthropist Bob Barker, and actress/activist Jorja Fox, all of whom testified before Capitol Hill staffers in early November. The announcement of the bill received huge media coverage and offered a platform for ADI to discuss the ethics of animal circuses. 4. Beagle Freedom Project’s rescue of 40 beagles from an animal testing laboratory in Spain (soon joined by three more) was the third rescue by the group. Coverage on NBC Nightly News with Brian Williams two nights in a row, as well as the Today Show, catapulted the group to national and international attention. In the process, people worldwide learned for the first time about the horrors of animal testing, and were motivated to shop cruelty-free. The video of BFP’s second rescue in June of this year racked up over three million YouTube views because of the interest in the rescue. 5. Another investigation by Mercy For Animals into Sparboe Egg, the fourth largest egg producer and a key supplier to McDonald’s, resulted in what was undoubtedly the biggest economic hit to a factory farm in history when the fast-food chain, and several other major retail customers, cut ties with Sparboe. To add insult to injury, MFA filed a complaint with the U.S. Federal Trade Commission for Sparboe’s false and misleading claims about its animal care standards. 6. Stop Animal Exploitation Now released a comprehensive report on the use of non-human primates in federally regulated animal testing labs in October. The report, based on USDA documentation, included the little-known “exemptions” to welfare laws that mean animals can be deprived of enrichment, food, and water; that permit severe confinement; that deny anesthesia for procedures; and that even allow cages to go weeks without cleaning. Although this story did not receive nearly enough attention from news media, SAEN’s research into the issue was validated when in December the National Institutes of Health announced that it would temporarily stop funding chimpanzee research, and Harvard University’s primate lab was found committing five violations of the Animal Welfare Act. 7. Compassion Over Killing announced a class-action lawsuit on behalf of consumers alleging a price-fixing scheme by dairy industry trade groups representing 70 percent of the market. The suit relies on the common practice of “dairy herd retirement” in which cows are killed, thus reducing dairy supplies and inflating prices. This is another story that received little major media attention, and we hope that developments in the case will allow it to come into the spotlight in 2012. 9. The 11-minute video “Farm to Fridge,” narrated by actor James Cromwell, hit with a bang in Spring 2011. The compilation of footage included pigs, egg-laying hens, chickens, turkeys, dairy cows, beef cows, and fish. It was a wake-up call for omnivores all over the world, and was viewed online by millions. Mercy For Animals also sponsored a 42-city, 12,000-mile tour where “Farm to Fridge” was shown on giant TV screens on a specially designed truck that parked in conspicuous areas like shopping and dining districts. The tour earned massive press coverage in each city, from TV news to college papers and everything in between. The success of the tour and of “Farm to Fridge” has inspired numerous “pay per view” events where people are offered a few dollars to watch a video about where their food comes from. 10. Humane Research Council released its research report Humane Trends, after compiling years of data across 25 different categories to evaluate the status of animal protection in the U.S. Although not a top public or media story by any means, the information, like all HRC’s work, is illuminating and of value to activists. Incidentally, the U.S. received a score of 34 out of a possible 100 for its treatment of animals based on data on companion animals, farm animals, wildlife, and animals used in science and entertainment. HRC also released an illuminating report on all USDA food recalls of animal products from 2006-2010 that should be of great interest to food safety advocates. Evolotus was proud to play a role in earning media coverage for clients such as Mercy For Animals, Animal Defenders International, Beagle Freedom Project and Fur-Free West Hollywood in 2011. Thanks for posting this. It’s nice to hear about the positive changes that occur on behalf of animals. There is so much more that needs to happen in this world, and at times I find it overwhelming and depressing, so it’s in these moments that I feel inspired and hopeful. I agree with Amy 100%, so great to hear these stories of compassionate change! I hope the world continues to evolve into a kinder place. Right now, I am going 100% vegan. The first five seconds of the video pertaining to the first article did it. I just can’t believe it. I’m sick to my stomach and am in a very depressed mood. Who are these monsters that do these things? I know there are many sick people in this world, but I didn’t realize cruelty was THAT casual. Do these men come home and spend time with their loving family after what they’ve done at work? I’m never going to touch anything other than raw fruit again, but I’m not so optimistic the rest of the world will change. Sorry to be a downer. Just want to follow up that I’ve been vegan since I wrote that post, about six months now. Luckily, I found the Abolitionist Approach website shortly thereafter and learned a lot. The raw thing lasted a month until I moved (I lived in a food desert); now it is mostly pasta dishes, heh. « Who is Saving Animals?